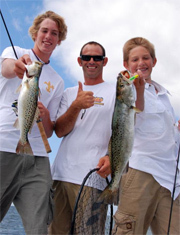 We are the premier Outer Banks fishing charter experience. Our Outer Banks fishing guide brings you to the best NC inshore fishing waters by boat to catch cobia, trout, flounder, drum, Spanish mackerel, striper, and more! We also offer a variety of family activities including: crabbing, dolphin watches, clamming & island walks. Don’t forget sunset tours with the kids!!! We look forward to customizing your Outer Banks fishing charter experience just the way you want it! If you don't find the answer to your question please contact us and we will be sure to get back to you. We'll provide all bait, tackle, ice, life jackets, and fishing license. You should bring water, your favorite snacks, sunscreen, sunglasses, hat, raincoat, and a camera. If you are booking a winter charter make sure you dress warmly. How long does the charter trip last? Check out our prices for details of trip times and duration. What does a charter trip cost? Check out our prices for package costs. Call us for offshore booking. We run trips year round. Please call us 252-256-8083 for availability. What are the maximum number of people you can take on your trips? We are licensed to take 4 guests on our boat. Where should I meet you to start our trip? Meet us at the state boat launch at Pirate's Cove in Nags Head, NC. Here's a nice little Google Map for you.